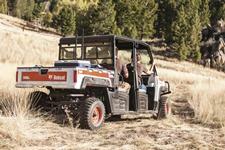 Even for your toughest jobs, the 3400 utility vehicle is a formidable competitor. 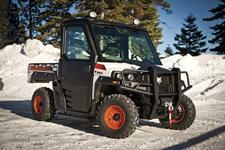 Built on the foundation of legendary Bobcat toughness, it’s ready to power your most difficult work. A continuously variable transmission (CVT) packs the power you need: quick acceleration and travel speed up to 40 mph* with the optional speed kit. Choose between diesel or gas models with true four-wheel drive. The rock solid suspension system contributes to industry-leading payload and towing capacities. Customize it with an entire line of accessories that make it uniquely yours. Dozens of cab configurations ensure your machine is outfitted exactly the way you want. Bring your entire crew directly to their work without sacrificing any power. With an extra row of seating, the 3400XL can carry up to six people. Combined with industry-leading payload and towing capacities, the 3400XL will quickly become an unstoppable force at your workplace or home. It all starts with a strong continuously variable transmission (CVT) that packs the punch your work requires. Travel up to 40 mph* with the optional speed kit. Select a diesel or gas model – both with true four-wheel drive. Solid suspension contributes to industry-leading payload and towing capacities. When you need a workhorse that comes without compromise, the 3650 utility vehicle brings everything you need for the job. The Multi-Attachment X-Change™ (M.A.X.) system and front PTO deliver attachment functionality that makes it a leader in its class. 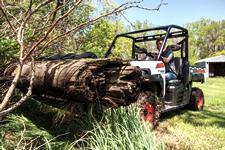 It’s powered by a diesel engine and a hydrostatic transmission that makes operating 8+ attachments simple and easy. And with a modular cab, heat and air-conditioning, you can use the 3650 year-round. 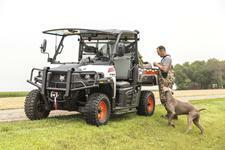 Make the machine yours with a full line of accessories and dozens of configurations.